SpringerLink is an online information service for scientific books and journals, especially in the fields of mathematics, environmental and physical sciences, engineering, computer and biosciences, but also including humanities, social and behavioural sciences. 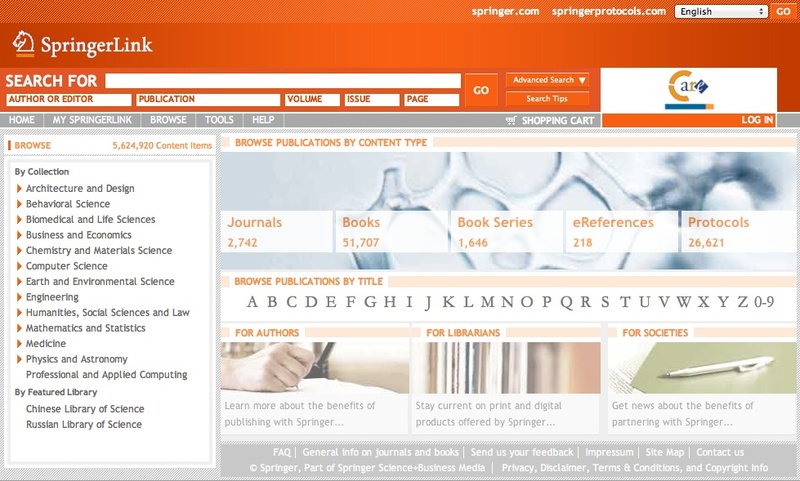 Through its search features, SpringerLink offers free access to almost 5,400,000 documents, including tables of contents and latest issues abstracts of more than 2,700 journals, references for over 50,000 books and endless entries in the subject collection and in a variety of specialized areas. All former Kluwer Academic journals are available here, along with more than 200 publications related to social sciences. The journals full-text content is available (in pdf or html formats) only to paid subscribers, both individual or institutional. Registration is not required to view abstracts or tables of contents, but registered registered users are entitled to personalize the site’s features and to other benefits. Beside a simple keyword search option in the homepage, a more advanced search facility is also available, along with a comprehensive FAQ file. Overall, this is a large interactive databases for high-quality material and references, targeting particularly researchers and scientists worldwide.